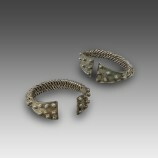 The two bracelets, which look very similar but are not identical, are composed of several twisted wires of silver arranged in a semi-circle; they are soldered to two triangular plates that form the ends of the adornment. 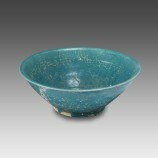 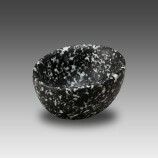 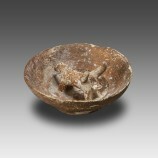 This thick-walled bowl is outstanding both for its excellent state of preservation and for its perfect shape. 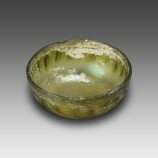 It was molded and pressed in light green glass, while the finish was obtained by polishing and by grinding. 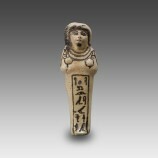 This ushabti represents a child wearing a rounded, achromatic wig, which also includes a long black lock ending in a curl: this detail characterizes the figure as a young prince. 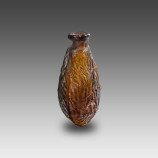 Vessels in the shape of dates, which look very realistic with the vertical grooves imitating the wrinkles of the dried fruit, are among the most famous and popular glass vases of the early Imperial period. 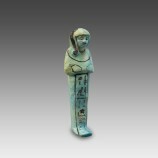 This ushabti represents a male figure with a short false beard and a rounded wig, only painted on the front part of the statuette. 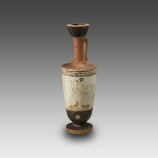 This idol is composed of three elements separated from each other: the bottle-shaped base, the cylindrical stem and the standard with the stylized animals. 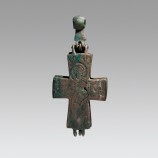 The cross, that can still be opened and closed, is composed of two bronze boxes with were molded and joined by hinges. 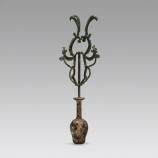 A thick suspension ring enabled the encolpion to be worn as a pendant.